The School of Education's professional programs operate from a well-developed strategic action plan that first evolved in 1985. The plan has been revisited and updated continually. The plan aligns purposefully with the university's goals and builds upon essential knowledge and skills, research findings and sound professional practice. The knowledge base for each of the School’s academic programs serves as a foundation of the school's conceptual framework, "Educators as Reflective Professionals." The current strategic plan emerged from the university's UM/2020 Strategic Plan with three Flagship Goals and Seven Priorities of Excellence. 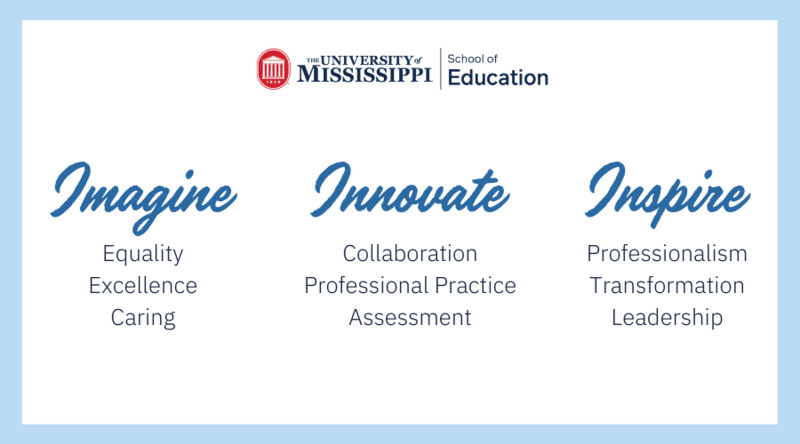 The School of Education has created 15 goals directly aligned with the university's priorities of excellence. These goals will help the School of Education advanced into the 21st century to meet the needs of an ever-changing society.